There are few things as soothing, welcoming, and downright entertaining as a book about books. I first read 84, Charing Cross Road as a young teenager and I still remember the feeling of kinship. I hadn't read many of the books she wrote about but I recognized the love for them. It was the same love I felt. I also blame or credit that book for my love of London. Who wouldn't want to travel to London and try to find their own Marks and Co. after reading it? I think that is the world of book lovers I am still looking for when I travel there. I am convinced London is populated with well-read people working in wonderfully cramped and crowded bookshops with books in teetering piles all around them. The amazing thing is, it is sometimes true. When I find that bookshop, that moment of trueness, I am transported to the feeling I had when I first read Hanff's letters and realized there was a whole world of people who felt the same way about books as I did. 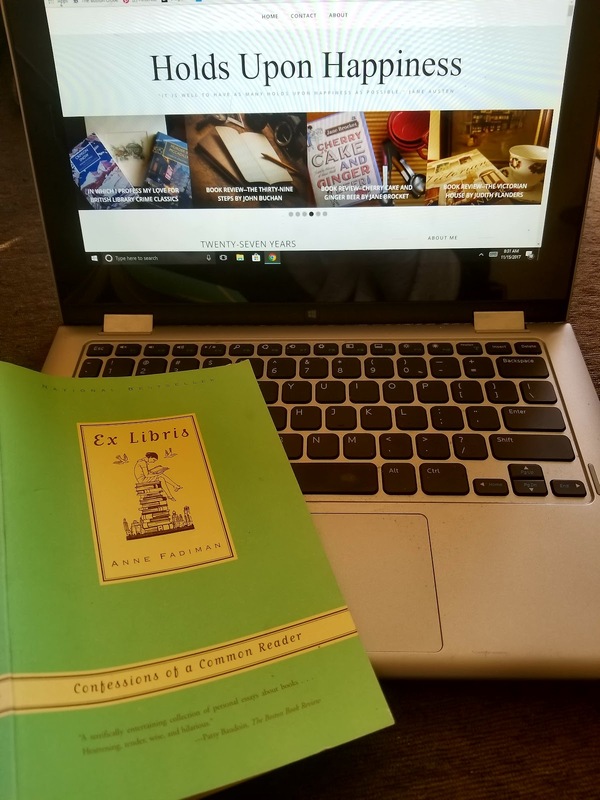 I recently read Ex Libris by Anne Fadiman and had the same feeling of recognition. Here, once again, was someone I understood, someone who loved books and words just as much as I do and is able to put that love into words and paragraphs that have me nodding my head in agreement the whole way through. My copy is full of sticky notes and I keep picking it up to reread favorite sections. Here is her description of how her family felt about books. The Fadiman family believed in carnal love. To us, a book's words were holy, but the paper, cloth, cardboard, glue, thread and ink that contained them were a mere vessel, and it was no sacrilege to treat these as wantonly as desire and pragmatism dictated. Hard use was a sign not of disrespect but of intimacy. I also loved her chapter on "you-are-there" reading, the practice of reading a book in the place in which it is set. Obviously, this isn't always possible but who can deny the seductive appeal of reading Anne of Green Gables while sitting by the Lake of Shining Waters on Prince Edward Island? Or reading Persuasion in Bath where Captain Wentworth and Anne finally resolve their differences? Fadiman tells a charming story about her daughter. When our daughter was four, she took her copy of Eloise to tea at the Plaza Hotel. Macaulay never fought at Thrasymenus. I never ran the Colorado River. But Susannah has actually hidden behind the red velvet curtains in the Grand Ballroom, slomped down the hallway on the fifteenth floor, and gotten dizzy in the revolving door with the P on it. When we got to the Palm Court, Susannah opened her book to page 40. Her eyes skittered back and forth between the plate of Gugelhopfen on the triple-tiered table in the picture and the plate of Gugelhopfen on the triple-tiered table in front of her. She didn't say a word. I knew what she was thinking. She was there. I have to stop before I end up just quoting the entire book for you but here is one more for your enjoyment and so I can have the sheer pleasure of sharing it. I can think of few better ways to introduce a child to books than to let her stack them, upend them rearrange them, and get her fingerprints all over them. It's a wonder to me that the young Diana Trilling, who had to wash her hands before she extracted a volume of Twain or Balzac from her parents' glass-fronted bookcase, grew up to be a booklover. Our parents' model was the playground; her parents' model was the operating room. By buying his set of leatherbound classics en bloc from a door-to-door salesman, Trilling's father committed the additional heresy, umimaginable to us, of believing that a library could be one-size-fits-all rather than bespoke. My brother and I were able to fantasize far more extravagantly about our parents' tastes and desires, their aspirations and their vices, by scanning their bookcases than by snooping in their closets. Their selves were on their shelves. Love it! Books about books are very cool. I remember reading one about 100 great novels as reviewed by 100 great novelists, though I can't for the life of me remember the actual title anymore. My to-read list grew so much while reading that one. Their selves were on their shelves. Yes, exactly! I do think reading choices or the lack thereof are a window into a person's character and personality. If you ever remember the title of the book you mentioned, let me know. It sounds interesting. Anna Quindlen's How Reading Changed My Life is one of my favorite books about books. I have lots of bookmarks in what's really a short book! I also found C.S. Lewis's An Experiment in Criticism really interesting. He looks not just at books (judged "good" or "bad" by literary standards, and he has some different ones) but also at readers (himself among them). I will definitely have to get a copy of Quindlen's book then. I always trust your recommendations. Thank you very much for reminding me of this book - I have had it for years, but somehow have never got round to reading it. Another book about books that I loved is Susan Hill's "Howard's End is on the Landing", a book about a year spent reading books that always get overlooked on a bookshelves, which seems singularly appropriate! You should read it! Howard's End is on the Landing seems to divide people. Some reviews rave about it and some don't seem to like it much. I think I am going to go with your recommendation though. It's funny, there have been a lot of posts about 'Books about books' in the blogosphere recently. These are the ones I can find, and many have been added to my Christmas present list! Thank you for all the suggestions. I think the only one I have read is Sixpence House. I have been hearing a lot about The Diary of a Bookseller. That is definitely going on my list. I absolutely adore books about books too, and Ex Libris sounds like an amazing example of this sub-genre. I really loved Samantha Ellis' How to be a Heroine and The Heroine's Bookshelf by Erin Blakemore. I can't believe I still haven't read 84, Charing Cross. I'll have to put it on my Christmas wish list! Definitely read 84, Charing Cross Road. It started my love for books about books. I almost bought How to be a Heroine recently and ended up getting something else. I'll have to try both the books you recommend.